There was a time when America was a land not only of unlimited opportunity, but also of limitless space. This is true no longer. These days, skyrocketing real estate and rental costs are forcing people to downsize their residences along with their lifestyles. Coupled with the shrinking of America is the aging of America. It is predicted that over the course of the next 50 years, there will be four times as many septuagenarians and octogenarians alive as there are right now. Many will live alone, in spaces downsized to accommodate less active lives. These are trends that appliance manufacturers such as Houston-based Equator Corp. are watching carefully. The company’s downsized household appliances are attracting a great deal of attention from the media and consumers – not only for the machines’ efficient performance, but also for their skillful adaptation to space-limited environments. For example, Equator recently introduced a ventless, front-loading, washer/dryer combination that occupies less room than an average dishwasher while still working its heart out. The "clothes processor" requires little electricity, and uses significantly less soap than a traditional washing machine. This clever device is an environmentally kinder and gentler alternative to the big top loaders that eat tremendous sums of energy, and dump thousands of gallons of contaminants into the water supply. TIMING IS EVERYTHING Although the idea of a combined washer/dryer is being touted as a new and innovative concept in America, it's actually old news in Europe. For the last 30 years or so, European countries have been dealing with burgeoning populations, increased longevity, crazy price increases and chronic space shortages. Few Europeans have the option of home ownership. With little room available, and real estate a precious commodity, many people live in cramped apartments. To cut costs, our European cousins share their rented domiciles with unobtrusive, highly-efficient home appliances which cost their owners neither arm nor leg to operate. 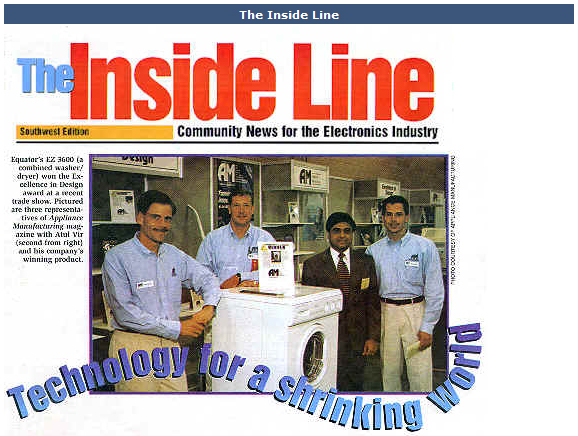 "Washer/dryer combinations were actually invented in the U.S.," said Equator president Atul Vir. "They were built by Philco about 30 or 40 years ago, but didn’t do very well. Back in the 1950s, large families and houses were the norm. It was the complete reverse of the current micro-family situation. Bigger was better, and concerns about water and energy savings were the last thing on people’s minds. Vir was encouraged by the local demographics. In Houston alone there were half a million apartment dwellers. Both they and their landlords were potential customers, he reasoned - and if this were true in Houston, it would also be true in big cities nationwide. But there were hurdles, and not of all them on this side of the pond. Vir approached several European manufacturers about developing a washer/ dryer for the U.S. market. Most responded pessimistically. It could not be done, they said, because the Equator unit ran on only 110 volts of electricity. While this made the machine cheaper and more convenient to operate, it would not generate enough heat to make the drying component feasible. GETTING THE WORD OUT Vir's search was rewarded when Philco Italy agreed to manufacture the units. (Philco, remember, was the U.S. appliance maker that had developed the washer/dryer concept in the first place.) When the company merged with Ford it got out of the appliance business, at least in this country. Overseas it was another story. Philco's European offices continued to make appliances customized to their own marketplace. Philco Italy had spent years developing washer/dryers. When Vir approached them, they were ready. When Equator brought the first washer/dryer units to the U.S., the company encountered a second hurdle: the American market wasn't ready for them. This would prove an expensive but temporary setback. By the early 1990s, the country was in a process of change, not unlike the one that had affected the nations of Europe decades earlier. Homes and apartments were getting smaller, more people were living alone, and it was becoming clear that our wasteful lifestyle was injuring the environment. But most Americans are Missourians. You've got to show 'em. Like the Beatles, this new European import had to pay its dues. "We couldn’t give them away at first," recalled Ron Combs, marketing vice president. "Everybody thought we were selling gadgets. We were trying to market the machines directly to appliance stores across the country, but the customers were very reluctant." That all changed when the company switched strategies and decided to get the word out through advertising. "We contacted 30 percent of the biggest magazines and newspapers in the country: Fortune, Forbes, The New York Times, you name it," Combs said. "The ad campaign did the trick. Our first major customer was a chain called Incredible Universe. Montgomery Ward was another. Incredible Universe eventually went out of business, but by that time we were already well on our way." Back in 1990, Vir was living in a London apartment. The apartment had an on-site laundry facility consisting of a washer/dryer, not unlike the ones that would one day be produced by Vir’s own company. The machine was only one of many energy-saving devices Vir encountered overseas. When he arrived in Houston a short time later, he was already thinking of ways to bring similar technologies to this country. Traditional, top-loading washing machines have been targeted as one of the biggest energy wasters in the country. Top loaders are less expensive to produce than the front-loaded EZ 3600, but what is saved in manufacturing costs is lost in water and energy expenditures. Top loaders require 50 gallons of water to operate, while the EZ 3600 needs only 13 gallons. Moreover, the 3G00 dries as well as washes, and does so ventlessly. The 110-volt clothes processor can be plugged into a kitchen faucet via an F connector. This small, F-shaped device makes it possible for the machine to function where only one water outlet is available, as in a typical kitchen. The machine’s compact size belies its 13- pound load capacity. The EZ 3600 is also easy on the ears. An arrangement of shock absorbers works with a complex spring suspension system to smother vibrations. The machine is virtually silent. All of this makes the unit ideal for apartments, particularly in urban areas with lots of historical buildings under renovation and reconstruction. Not surprisingly, one of Equator’s first successes was with a historical building in the company’s home base of Houston. A developer wanted to convert the structure into an apartment complex, and spent a bundle creating a labyrinthine venting system for an in-house laundry facility. Equator sold the developer on the EZ 1000, the company’s first successful product. Unfortunately, the 1000 required venting to operate. t was shortly thereafter that the ventless EZ 3600 was introduced to the marketplace. Victorian and Depression-Era buildings have no vents, because there was no need for them in the days before automatic washers and dryers. When these old structures are renovated, it can cost thousands of dollars to create a laundry venting system. Ventless front-loading washer/dryers, while more expensive than traditional top loaders, save contractors lots of money in the long run. The automatic preheat and drying cycle kicks in as the final wash spin is under- way. The system employs a condenser dryer in which the hot air used to dry the clothes is channeled into a drum, instead of being released into the great outdoors via a dry vent hose. Cold water is drawn into the drum at the same time. The two mix, and the result is a condensing process. "Front-loaders require very little water," says Combs. "For this reason, utility companies in some of the western states are giving out rebates for the purchase and use of our machines. This creates an obvious advantage to consumers, but the primary advantage to front-loaders is that the water always stays near the bottom of the machine during the washing cycle. The rubber boot around the door has a rectangular hole at the top. Since the water never reaches the top, the water can't get into the heating elements and electronics. In other words, front loading helps to make washer/dryers possible." The Gemini three-door refrigerator is another Equator masterpiece. This unit, only 75 inches high and 23.5 inches across, offers everything a standard refrigerator does, with one significant exception. The third compartment doubles as either a freezer or a refrigerator. Air conditioning units, designer-built ovens and cooking tops are also in the works. Considering how small our world is becoming, these products couldn't have arrived at a better time. Besides its popularity with consumers, Houston-based Equator Corp. is attracting attention from national trade organizations as well. At the 1997 Appliance Manufacturesrs Conference and Exposition, held this past September in Nashville, the company won the Excellence in Design award in the major appliances category. Past winners in various categories have included Frigidaire, Compaq and Microsoft. "The product's control panel is very simple and well thought out, and the product fills a real need in today's marketplace," said judge Carl Garant, dean of the Columbus College of Art and Design, in selecting Equator's EZ 3600 washer/dryer for the award. The warm air is converted into droplets, and the moisture in the chamber is siphoned out of the machine through a drain hose. Lint and other unwanted particles are trapped in a screen. Because the unit is so small, it can be installed where a dishwasher normally would, allowing it easy access to the kitchen drainage system. The EZ 3600 is Equator's first ventless washer/dryer system. The two earlier models, the EZ 1000 and 1500, did not include the condenser, which made venting a necessity. Like the 3600, these early units featured washing as well as drying, a not-so-easy combination that required years of research and development.